He may be backing the Beaver but that’s as far as Hori BOP’s love affair with the Waikato rugby team goes this weekend. The mad-cap Steamers mascot has vowed to continue his unique tribute to 2011 Rugby World Cup hero Stephen Donald when Bay of Plenty hosts ITM Cup neighbours Waikato in Tauranga on Sunday, despite Donald missing out on Waikato’s playing 23. 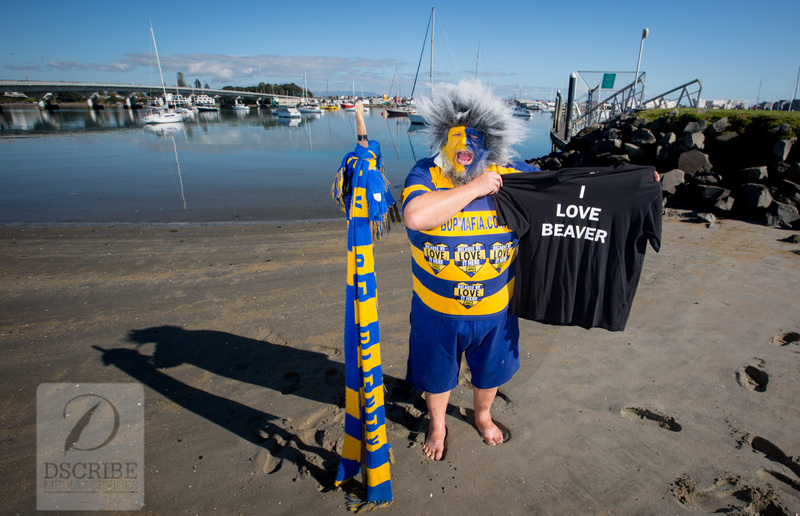 For each of the past four years, Hori – aka Tauranga identity Terry Leaming – has endured a freezing mid-winter swim to commemorate ‘National Beaver Day’. He’s swum the Waikato River three times before Bay of Plenty v Waikato matches, adding in Otago Harbour in 2012 when the southern union was in financial strife. This Sunday, Leaming will swim across Tauranga Harbour, grab a pie and some fish n chips, then wander up to the Tauranga Domain to perform sideline duties. “It’s fair to say the water is bloody freezing at the moment but it’s my way of honouring the Beaver, who went through hell and back before the World Cup final,” Leaming bellowed. He had considered skipping this year’s swim but Donald re-signing with Waikato last week – after four years in Europe and Japan – was all the motivation he needed. Now the colorful colossus is using the opportunity to give All Black coaches a stern message, with the 2015 World Cup squad also named on Sunday. Leaming has promised to shout Donald a whitebait fritter if the first-five turns up to watch his swim before the match. Donald was famously whitebaiting up the Waikato River when called late into the 2011 final, where his match-winning penalty – and a poorly-fitting jersey – elevating him to cult status. And he’s secretly pleased Donald won’t be playing this weekend, as Leaming expects a red, yellow and black mist to descend once the whistle sounds for kick-off.